Have you ever been curious about how the age of a home impacts its value in the market? This thought occurred to me as I was reviewing last week's article about home values in the most popular Tallahassee neighborhoods. While some neighborhoods were far more costly due to amenities and location, there were some that were clearly under or over valued simply due to how old most homes were in the subdivision. 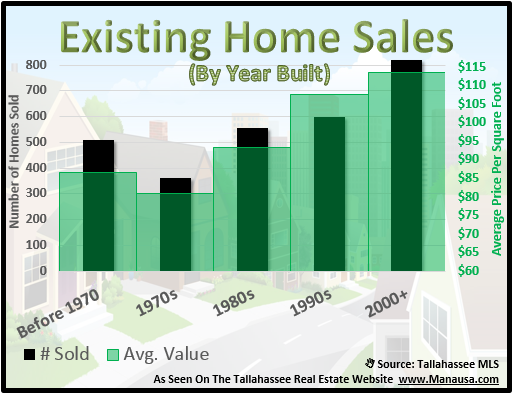 In order to see if their was a correlation between how old a home is an its value in the market, I pulled all the home sales in the Tallahassee MLS from 2013 and sorted them by "Year Built." The following real estate graph clearly shows there is a general relationship between a home's age and its value. In the graph above, there are five different age groups used to compile our report. Homes that were built before 1970 is the first group from the left, then each decade thereafter falls in the columns to the right. The number of homes sold by each age group is shown in black (and measured on the left vertical axis), while the average value for each group is shown in green (price per square feet shown on the right vertical axis). So in a nutshell, newer homes are consistently selling for more than are older homes, with one exception. Apparently, "really older homes" do better than homes sold in the 1970s, but I have a suspicion that what we are seeing is a "location" offset. Some of the oldest homes selling in Tallahassee are likely in premium locations, and they might be impacting the first group. So many variables go into determining the value of a home that I don't believe that we will see online tools become very accurate for many more years. For example, the "Zillow Zestimate" provides grossly inaccurate values for most areas, and reliance on such tools often causes home sellers to overprice or underprice their homes. The only true way to determine what your home is worth in the Tallahassee real estate market is to get a valuation from a highly qualified real estate professional. If you would like to know the value of your home, just drop me a note and we will help you with that right away.